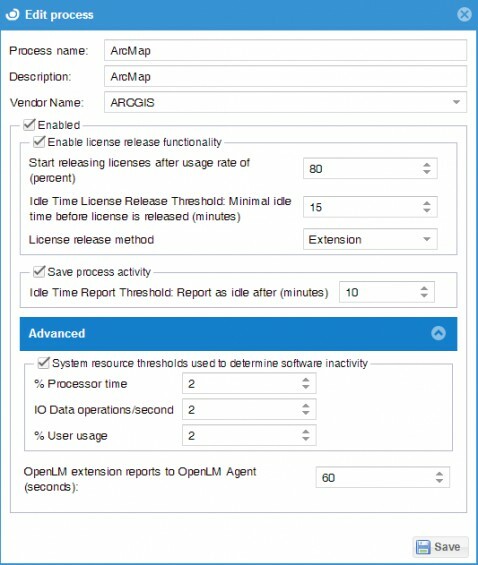 OpenLM may automatically detect idle FlexLM licenses, remove them and suspend the application’s process. This method is referred to as “Suspend and Resume”. OpenLM can automatically save and close idle MATLAB , Autodesk, Solidworks and ArcGIS sessions. It does so with the use of dedicated extensions, specifically implemented by OpenLM for each of these applications. This method is referred to as “Save and Close”. This method is discussed on this current document. OpenLM 3.1 has added a new method for further enhancing idle license identification and retrieval. This is referred to as retrieval through “Agent procedures”. The ”Save and Close”method is only applicable to four specific licensed application vendors: ESRI (vendors of ArcGIS), Autodesk (vendors of AutoCAD), Solidworks and MathWorks (vendors of Matlab). These applications are named by convention “Extension Supported” applications. In the ”Save and Close” method, an idle station is identified, the user’s work is saved, and the application is actively shut down. The application is not just suspended, as opposed to the ”Suspend and Resume” method. The location of automatic saving is configurable, so the saved session does not necessarily override the current project. See the ”Extension dedicated functions” section below. The “Save and close” method requires the installation of an OpenLM Agent on all end-user workstations to which license retrieval is to be applied. 1. Close the Extension enabled application (ArcGIS / MATLAB / Autodesk / Solidworks ) on all end-user workstations. 2. If not previously done, Install the OpenLM Agent onto the workstation from OpenLM Download. This can be done either manually, or deployed quietly via msiexec or GPO. 3. When installing the OpenLM Agent manually, if an Extension Supported application (e.g. ArcGIS, Autocad, Matlab) is identified as installed on the computer, the OpenLM Extensions dialog window will open. Choose to install the appropriate software extensions, thus enabling OpenLM to treat an idle application in the Save and Close method. 4. Towards the end of the installation process, the Agent Configuration dialog window opens. Type in the OpenLM server with which the Agent is required to connect, and click Apply. 5. Similar options are available through the deployment flags when installing the Agent silently. 6. 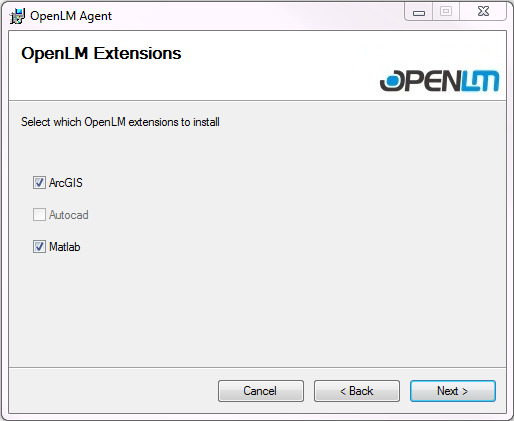 The OpenLM Agent attaches an extension to each of the Extension enabled application (ArcGIS / MATLAB / Autodesk). It is good practice to ensure the extension has been properly installed. See the “Verify the OpenLM Extension Installation” Appendix below. 1. Open the OpenLM EasyAdmin web application (Windows Start Menu → All Programs → OpenLM → OpenLM EasyAdmin2). 3. Select an extension enabled application (ArcGIS / MATLAB / Autodesk), and click the ‘Edit’ button. 4. In the Edit process window, click the drop-down menu at the License release method. Select Extension. 5. Check the ‘Enabled’ and the “Enable License release functionality” checkboxes. 6. Set the “Enable License release functionality” parameters. These parameters determine the policy for license retrieval, once they have been labeled Idle. Start releasing licenses after usage … (Default: 80): Licenses will only become candidates for retrieval only if more than the defined percentage of licenses have been checked out. 7. Expand the ‘Advanced’ panel, and set the system resource threshold parameters. These numbers are thresholds used for determining whether the monitored application is idle. The default values shown should not be changed unless explicitly instructed by OpenLM’s support team. Changing these values inappropriately can harm the OpenLM system’s performance. I/O Data operations / sec (Default: 2): Similarly, this is an I/O threshold over which the application is considered active. The software will only be closed if the number of disk operations per second is lower than the value shown. your application license is set to be optimized by OpenLM in the “Save and Close” method. Idle applications will be suspended on the workstation. An appropriate notification will pop up on the workstation monitor. Application activity may be resumed either via the suspension notification or via the OpenLM Agent interface “Recently closed documents” on the end-user’s workstation. 2. Both the License Server and the Agent report drawn licenses of Extension Supported applications. Note: OpenLM recommends keeping the extension dedicated preferences at their default values, as this should be considered an advanced users’ section. In order to apply “Extensions dedicated” configuration, click OpenLM Start → Administration → Active Agent, and select the ”Extension dedicated” tab. Specify the folder in which the automatically closed projects will be saved. Checked (Default): The same filename is used for project saving each time the application is detected as idle and closed. Unchecked: Each recurrence of an idle application closing event brings about the creation of a new copy of the saved project. Checked: The application’s extension list is shown when the application is restarted after detected as idle and closed. This is useful for manually prompting users to confirm their usage of a certain extension. Unchecked (Default): The application’s extension list is NOT shown when the application is restarted after detected as idle and closed. Checked (Default): Extensions that require licenses are closed together with the idle application. This requires the user to obtain a license for the extension when restarting the application. Unchecked: Extensions that require licenses are NOT closed together with the idle application. Checked (Default): Extensions that do NOT require licenses are closed together with the idle application. This requires the user to obtain a license for the extension when restarting the application. Unchecked: Extensions that do NOT require licenses are NOT closed together with the idle application. There are two methods of operation to deal with an event in which an application was NOT compelled to close according to the Active Agent’s preferences, but a licensed extension that is embedded in that application WAS compelled to close. These two optional operations will either turning off the extension, or shutting down the application altogether. Situations may arise when a license is unavailable for use and unknown to the System Administrator. Selecting this option will provide the chance to find the license and return it to the pool of available licenses for use. This is only applicable for Extension Supported applications like, AutoDesk, ArcGIS, and MATLAB. This is a two-step operation. Step one is to check the box to shut down any working applications. Step two, is to set the time as to when any working application are automatically shut down. Checking this box will prevent agents from adjusting ArcGIS license levels. This heading lists a number of objects that would not be saved when the application is closed; e.g. : ArcCatalog.exe is a file browser which holds no substantial data at its own right, and therefore is not saved. Click ’Add’ to submit more items to the list. This heading lists directories onto which no changes would be made upon application automatic closure. This is intended for projects that should keep the same static information every time they are started. Click ’Add’ to submit more items to the list. ESRI Desktop ArcGIS: Click Customize → SelectExtensions. Confirm that OpenLM Arcgis Extension appears in the Extensions list. If the Extension is not installed, an Error message should appear, stating that the “OLM” command is not recognized.